How to Light a historic interior appropriately--or create a realistic period look--can be a perplexing problem. Few people want to return to the days when light came mainly from candles, kerosene, gas or available sunlight. But acceptable ways of re-creating old lighting do exist, and Lighting for Historic Buildings shows how to find them. 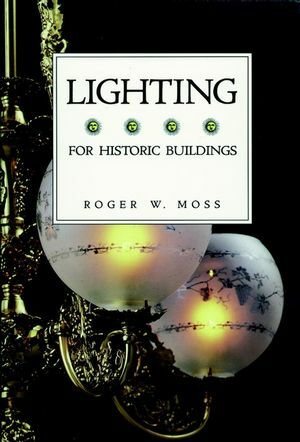 This invaluable guide provides both a history of lighting in America and a catalog of 481 suitable reproductions available today. Noted historian Roger Moss shows how interiors from the 1620s to the 1930s can be well lighted yet still maintain their character. Reproductions are organized by lighting source (candles, burning fluids, kerosene, gas and electricity) and fixture type (chandeliers, wall brackets and hall lights). Also included are chapters on street lighting and specialty items, a glossary and a reading list. Roger W. Moss is an historian, educator, administrator and author in Philadelphia, Pennsylvania. Throughout a long career he has also been an aggressive and entrepreneurial advocate for the preservation and authentic restoration of historic buildings. Whale-Oil, Lard-Oil and Burning-Fluid Fixtures: 1783 to 1859. Kerosene Fixtures: 1854 to 1934. Gas Lighting: 1817 to 1907. Electric Lighting: 1879 to 1930.